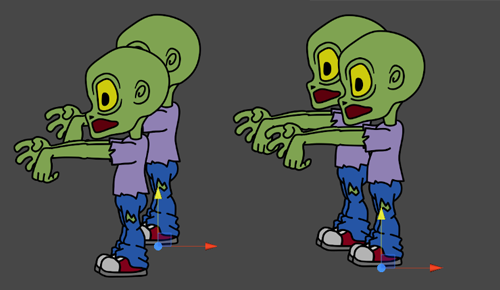 Sprites are rendered with a Sprite Renderer component rather than the Mesh Renderer used with 3D objects. Use it to display images as Sprites for use in both 2D and 3D scenes. In Unity, go to Assets>Import New Asset… to bring up your computer’s Finder (Mac OS X) or File Explorer (Windows). See Importing Assets for more details on this and important information about organising your Assets folder. If your project mode is set to 2D, the image you import is automatically set as a Sprite. Set the Texture Type to Sprite (2D and UI). See 2D or 3D Projects for details on setting your project mode to 2D. Renderers in Unity are sorted by several criteria, such as their Layer order or their distance from the Camera. 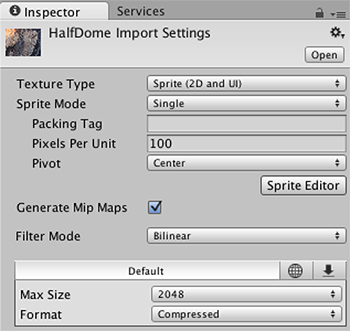 Unity’s GraphicsSettings (menu: Edit > Project Settings > Graphics) provide a setting called Transparency Sort Mode, which allows you to control how Sprites are sorted depending on where they are in relation to the Camera. More specifically, it uses the Sprite’s position on an axis to determine which ones are transparent against others, and which are not. To have Unity manage this automatically, set the Transparency Sort Mode to Custom Axis, and set the Y value for the Transparency Sort Axis to a value higher than 0.